My modus operandi when perusing a Japanese menu is usually one of indecision. 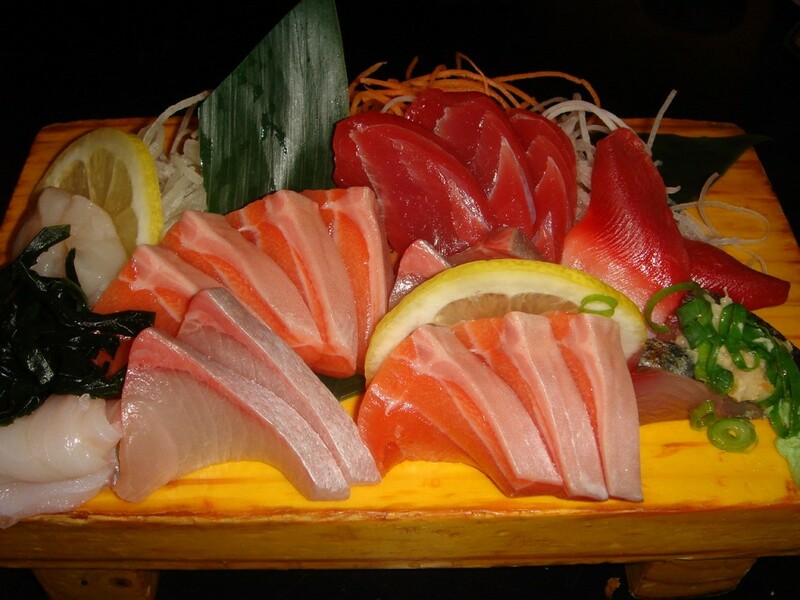 Having many favourites, I want to eat and order everything, from the sushi and sashimi to all the various different types of cooked foods. My Japanese food palate was well honed by a three-month home stay in Tokyo as a high school student when I was studying Japanese at school. My housemother was a wonderful cook, and extremely versatile, providing me with a tremendous introduction to Japanese cooking. There were many dishes that she made which I still reminisce about today. Not only were they delicious, they were also home-styled dishes, some of which I have never come across in a Japanese restaurant since. Japanese was on the menu tonight as we headed to Musashi Restaurant. Named after one of Japan’s most famous Japanese samurais, Musashi Miyamoto, it is located towards the Chinatown end of town, on a not-so-trendy corner. However that certainly didn’t appear to have undermined its popularity. I could see from a distance as we walked towards the restaurant that there was a long queue and it was barely 7pm. As is my habit, I moaned about having to wait, but at least its policy of numbered ticketing for waiting customers allowed me a 25 minute wait time to overcome any indecision I may have had about what to select from the menu. Musashi Restaurant prides itself on offering an Izakaya style of dining, the Japanese version of tapas in a relaxed setting more akin to a pub than a restaurant. The Izakaya concept is about sharing, so there were extensive menu choices including starter-sized plates, sushi and sashimi, various fish of the day, rice and dish noodles and “Musashi” specials. There were also bento boxes, although these were predominantly for the lunch time diners. Given the choice, and given how I am usually struck by indecision, it was perhaps surprising that for once I knew immediately what I wanted. However, the fact that there was a premium grade No. 7 AAA wagyu sirloin steak on the menu probably helped to alleviate any indecision. 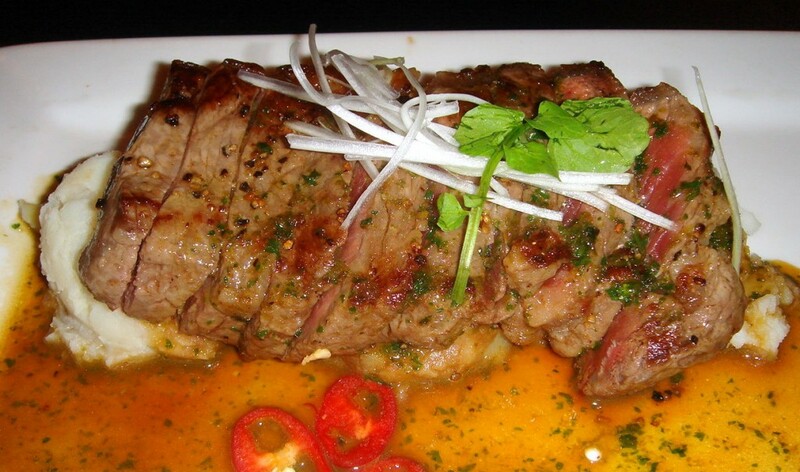 Wagyu beef is famed for its ‘marbling’, which gives it intense flavour and tenderness. The grading ranges from 1 to 12+, the latter being the optimal marbling possible. At No. 7, it was not quite the optimal, though pretty close, and at only $25 for 170g, it truly was incredible value. Although we’d requested medium rare, our wagyu was served rare. Despite this, it was delicious, tender and with that fatty, marbled taste permeating the meat, if perhaps a little chewy in parts. It was served with tasty buttery mash potatoes and broccoli that were unfortunately both cold on arrival. However that did not prohibit me from enjoying the gloriousness of the wagyu beef. 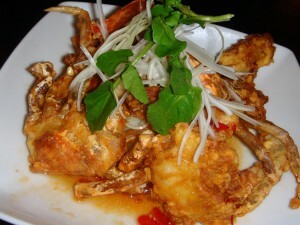 We also settled on some of my other adored dishes: kaki (deep fried oysters) ($15.80), sashimi ($22) and soft shell crab with ‘original’ (chilli) sauce ($9.80). 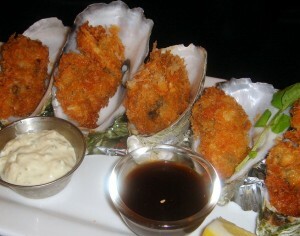 The kaki, deep fried with breadcrumbs, was wonderfully crunchy on the outside with juicy oysters on the inside; the sashimi was intensely fresh. The soft shell crab was flavoursome but a little below par for the batter was a little soggy and thus lacked a delicate biting crunchiness. 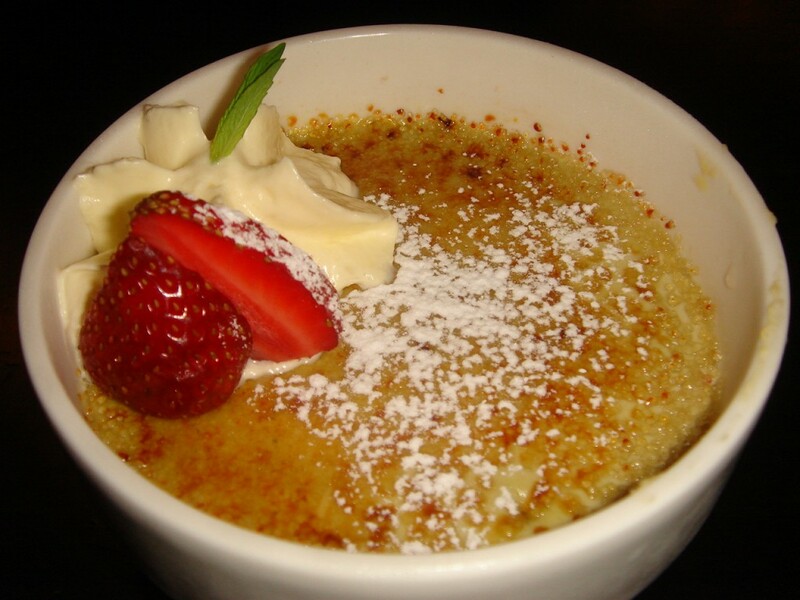 For dessert, we trilled over the green tea crème brûlée ($4.80), which proved a really nice way to finish off the meal. It was creamy and nicely flavoured with green tea, and surprisingly layered with red beans along the bottom which added a nice textural contrast to the dish. The food was perhaps more fusion Japanese, what with mash potatoes and crème brûlée, than classic Japanese. Regardless, it was still an overall thoroughly enjoyable experience for there was no doubting the freshness and quality of the ingredients. The cooking was solid even if a little more care was needed with the timing of plating up the food as was evidenced with the wagyu beef. The setting was relaxed and contemporary, the service hospitably Japanese, and our meal for three which came in at only $78 was truly incredibly value, a warrior effort that would probably have made even the samurai Musashi Miyamoto proud. In my book, Musashi is a restaurant worthy of a revisit, and with wagyu beef at only $25, I simply can’t wait. Hi. The waygu looks great. I buy it from my butcher once or twice a month and love it – usually grade 7 or 8 and porterhouse cut. The grades actually go to 12 but I have never seen it, I would hate to pay for grade 12 and don’t bother buying grade 6 or under, waste of money. Sometimes I get it cheap as a cancelled order to japan so it costs around $45 kg (really cheap) but the higher grades are usually sold for about $180 at the butcher. Actually for a cheap waygu meal buy a roast sirloin or similar, really cheap cut of meat and tastes great. Wow $45 is really good value. I would love to know where you get it from. You are right. Wagyu goes to grade 12. That was my mistake. It might have been a typo at the time. I’ll change it.